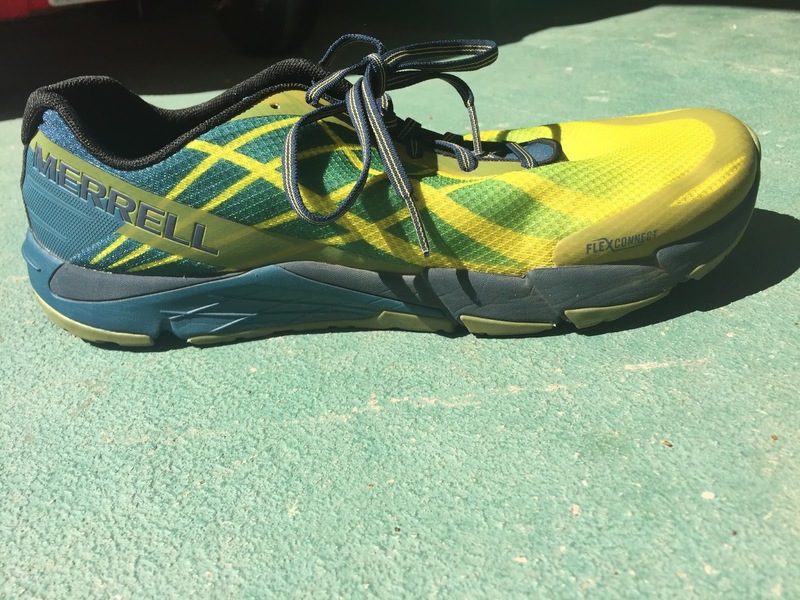 The Merrell Bare Access Flex ($90) is a lightweight, zero drop road/trail hybrid shoe. It weighs in at 7.3 oz/ 207 g for a men's size 9, 6.5 oz/184 g for a women's size 8 with a 15mm zero drop stack height. It's a pretty minimal shoe with a terrific upper and just enough protection to go out and have some fun. The upper on the Bare Access Flex is terrific. It's made of a lightweight mesh that's super breathable and dries very quickly. There are some TPU overlays to keep the foot in place and there's a little extra protection up at the toebox. 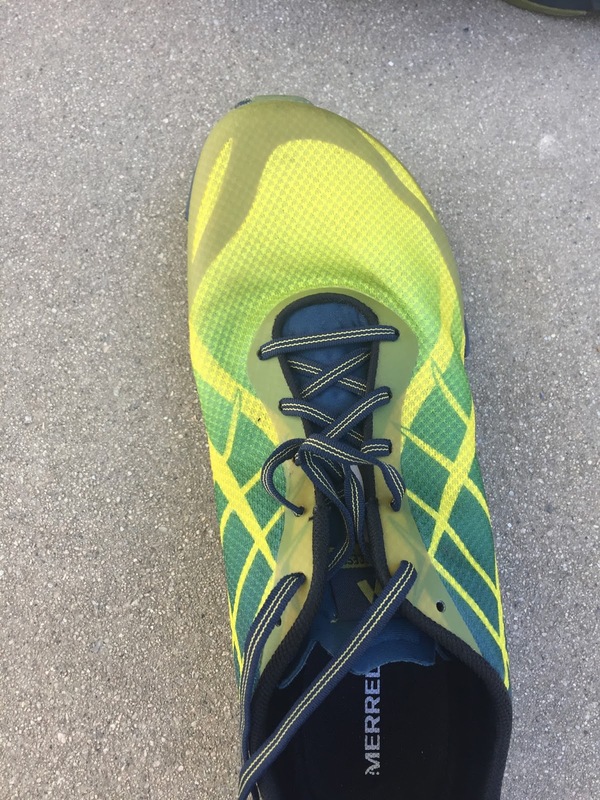 They do run large, so I recommend sizing down from your usual running shoe size by a 1/2 size. It's a good looking and bare bones looking upper that actually conceals some nice extra features. The lining is a neoprene material that's meant to control moisture and odor, as is the anti-microbial footbed (which is not removable). The lacing is simple and effective. The overall step-in experience of the Bare Access Flex is of stepping into a cushioned hi-tech slipper. The Bare Access Flex is built on an EVA midsole that is 15mm thick from heel to toe. It's definitely a minimal feeling shoe. 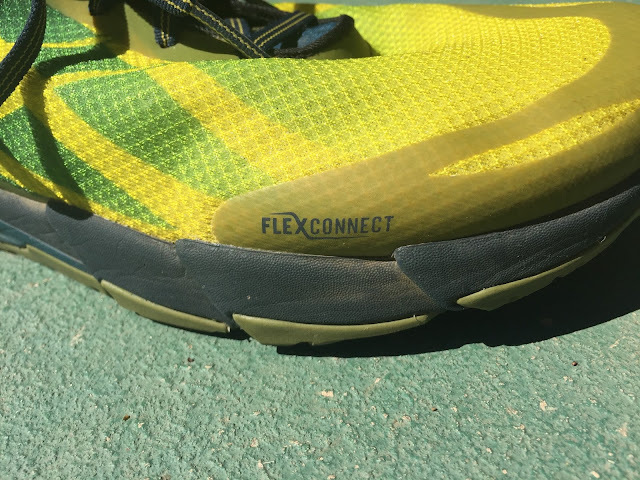 There are flex grooves on the bottom, described by Merrell as "FLEXconnect™ dual directional flex-groove EVA midsole for agility and stability on uneven terrain". Sure enough, if you look at the bottom of the shoe, there are flex grooves running both horizontally and vertically. The long groove running from front to back looks a lot like the old Pearl Izumi shoes to me. Merrell's "M Select™ GRIP+ outsole with anatomical grooves is sticky and durable for superior grip and traction on wet or dry trails". Essentially it's a very sticky and flexible outsole. There's no rock plate and it's not particularly cushioned, but it feels very secure across a range of surfaces and conditions. The Bare Access Flex is minimal for sure, but relatively protective. It's meant to be a road/trail hybrid. For me the ride is a touch harsh on roads, but is really nice on softer dirt trails--I really like it when the trail is wet. 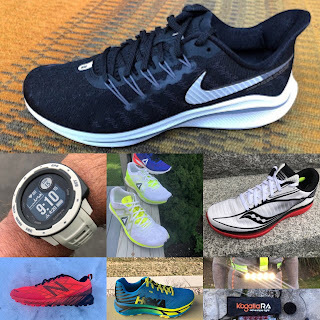 While it's not a shoe I'd go run a bunch of hard scrabble on, I'd certainly take it on fire roads or to jump around on bigger rocks. If there were some water crossings I'd be psyched to have this shoe on. 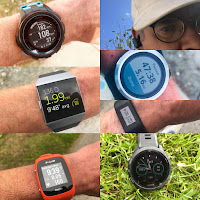 I'm not totally convinced of the shoe as a true hybrid, but if you have a mile or two of road on the way to a less technical trail it's a great choice--especially in wet conditions. The Bare Access Flex is an interesting beast. It's lightweight and has excellent grip on lots of different surfaces. It's not my first choice for a road shoe and I wouldn't use it on trails where I'd want rock protection. That said, it's a comfortable shoe to wear around. I used it a bunch recently to hike and enjoyed the 'barely there' feeling and security I felt on rocks and wetter surfaces. It's an affordable and relatively enjoyable shoe to have in the quiver. In a way it's like a more flexible, less protective version of the Vazee Summit. The Women’s Trail Glove 4 comes in 4 colors: Aleutian, Baltic, Black, and High Rise. A minimalist running shoe, the Merrell Trail Glove 4 is designed with many features that make this shoe more than just a trail running shoe for minimalist runners. I tested them on an easy going trail run to get a feel for a zero drop shoe, one without the kind of cushioning I am used to for sure. 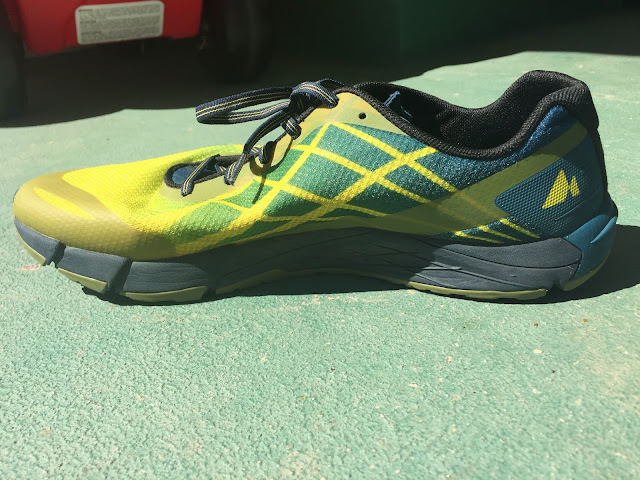 It is not my first zero drop shoe as I regularly run in Altra road and trail shoes. 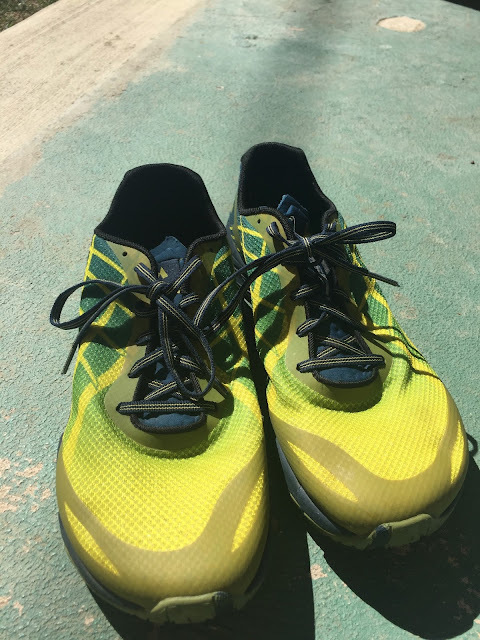 Lightweight with a wide toe box and a breathable upper mesh, the shoe has protective 4mm EVA cushioning pads, an underfoot Trail Protect plate to shield the feet from stone bruising and a Vibram outer sole that provided good grip on the trail. They fit me true to size. The tongue of the shoe opens only on the outer side of the shoe. It is integral to the rest of the upper on the medial or inside where you need support. 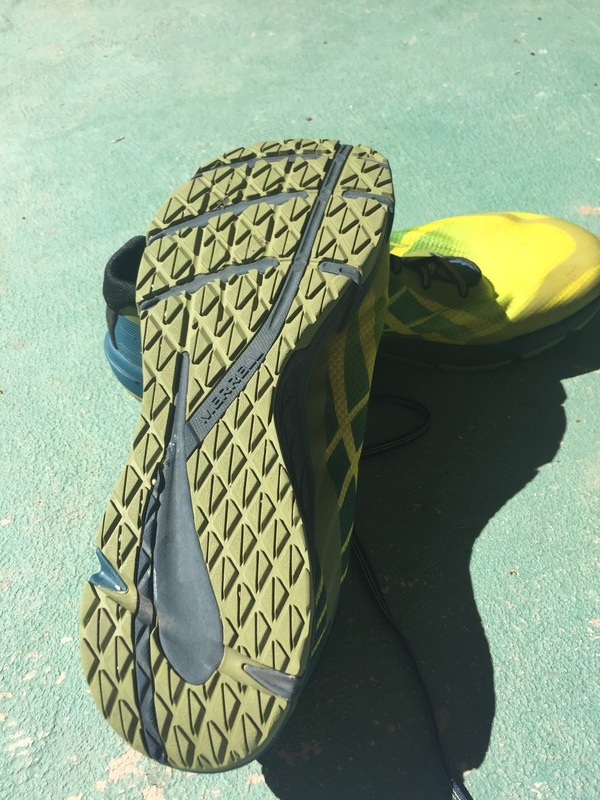 This is a neat feature that keeps the foot on the medial side securely in place. The more substantial and colorful stitched overlays on the medial side of the shoe add an interesting and attractive design element while providing functional support. My trail run went well. It was stable and protective over roots and rocks. My feet stayed cool on a very humid, warm day. I was surprised that despite the lack of cushioning my feet weren't beat up. I slip into my Glove 4 after a hike, for walks, running errands, and when flip flop season is over. I enjoy the feel of my feet literally hugging the ground. It would also be a great travel shoe. Lightweight, comfortable, and well designed, they are a welcome addition to my active lifestyle. The Merrell shoes were provided at no cost.The opinions herein are entirely the authors'. Nice review. I too am unable to run in such a shoe, but they are nice for daily wear, travel, walking the dog or when sandals are not quite enough. Love the socks Dominique! Added those cool socks Jeff. Darn Tough Merino Sierra Stripe Micro Cushion! Thanks for the reviews. Two questions on the Bare Access Flex: How is the room in the forefoot (I'm an Altra wearer); and does it fit true to size? Running Warehouse recommends sizing down 1/2 a size because they fit large. Thanks. Thanks for the question. I just updated the review! Yes, they run large and I'd size down by 1/2. They are certainly a more typical running shoe forefoot than the Altra, but I found them to be roomy enough. I had no issues with rubbing or feeling constricted. hope that helps. Good shoes! I also have this type of shoes and they are so easy in use and good for traveling. you have presented this article reacted these shoes awesomely.